WASHINGTON: US President Donald Trump said late Wednesday that he would deliver his State of the Union address once the federal government reopened, capping a day of brinkmanship with Speaker Nancy Pelosi, who told the president that he was not welcome to deliver the speech in the House chamber while the government was partly closed. The president’s seeming capitulation came even as House Democratic leaders said they were prepared to give him a substantial sum of money for border security — perhaps even the $5.7 billion he had requested — but not for a wall and not until he agreed to reopen the government. That figure is roughly double what Democrats had previously approved. On the other end of the Capitol, in the Republican-controlled Senate, lawmakers prepared for crucial votes Thursday on two competing proposals — one backed by Trump and Senate Republicans, the other by Democrats — that would bring an end to the partial shutdown, although neither might garner the 60 votes necessary for passage. On Day 33 of the longest government shutdown in history, Washington took on the air of a split-screen television. On one side was a spat between Trump and Pelosi over the president’s constitutional duty to periodically report to Congress on the state of the union. On the other, the House and Senate trudged along with their daily business, with lawmakers in both parties grasping for a way out of the shutdown stalemate. It now seems all but certain that 800,000 federal employees who have been either furloughed or working without pay for more than a month will miss another paycheck Friday. The best hope, people in both parties say, is that the expected failure of both bills in the Senate on Thursday will prompt bipartisan negotiations that could lead to a compromise. Those bills take very different approaches. Trump’s bill would include $5.7 billion for the wall and extend protections to some immigrants in the country illegally — protections that he himself revoked — while sharply curtailing access to asylum. The Democrats’ measure, which has been already passed by the House, would simply fund shuttered government agencies through February 8, with no wall money. Responding to Trump just before midnight, Pelosi urged the president — who pledged to deliver his address in the “near future” — to accept the Democrats’ bill. But with the House set to leave town Thursday, it is highly unlikely that the impasse will end by Tuesday, when Trump was scheduled to deliver his address, an annual Washington ritual that usually plays out with pomp in front of both chambers of Congress, the Supreme Court, Cabinet secretaries and honoured guests. For Trump, it would have been a moment to command the stage — with television cameras rolling and Pelosi stuck behind him, trying to figure out whether to grimace or nod. Now, the president is trying to paint Pelosi as a left-wing radical who cancelled the address for political reasons, despite her assertion that she simply wanted to postpone, not cancel, it because of the burden it would impose on Secret Service agents working without pay. In the afternoon, Trump pledged to “do something in the alternative,” and it was not clear at the time whether he had given up on holding the speech in the Capitol. Some lawmakers raised the possibility that he could deliver it in the Senate chamber. But others, as well as some Trump advisers, suggested it would be better for him to issue the speech at the border or during a rally. 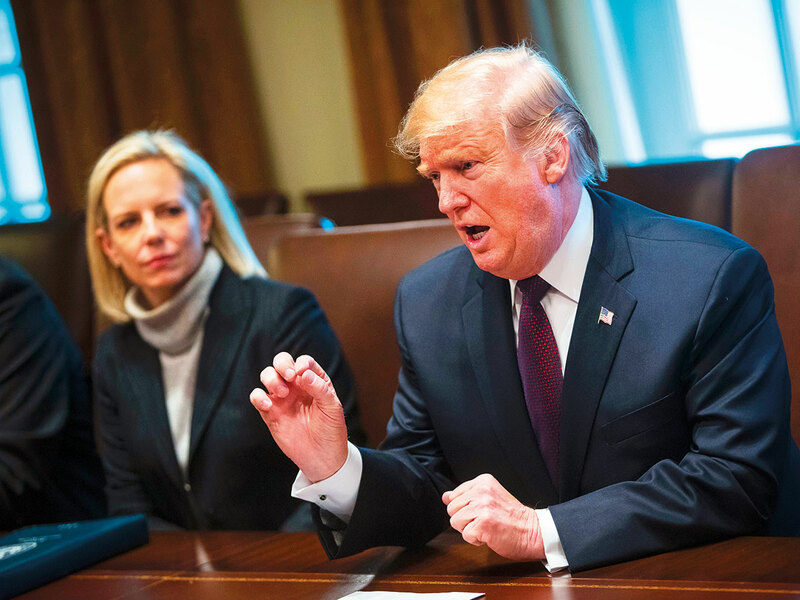 Trump’s actions during the shutdown have often seemed in response to criticism from allies like conservative commentator Ann Coulter and the prime-time hosts on Fox News. The network’s first reaction to the president’s decision to delay his speech appeared to indicate trouble ahead: “Trump Blinks” read the headline atop the Fox website. While the president is permitted on the floor of the House, he needs an invitation to speak. Pelosi had invited Trump to deliver the speech in a letter on January 3, when she was sworn in as speaker. But in a second letter date January 16, she warned that there were security concerns and asked that they “work together to determine another suitable date after government has reopened” or that Trump consider delivering it in writing. On Wednesday, Trump called Pelosi’s bluff, with a letter saying that he had checked and that the Secret Service had no such concerns. So he said he was accepting her initial invitation. Republican lawmakers piled on. The House Republican leader, Kevin McCarthy of California, released a video on Twitter of him signing the resolution formally inviting the president to the House. “Retweet if you agree that the State of the Union should proceed as planned,” McCarthy wrote. But hours later, Pelosi fired back with a letter of her own, telling the president she would not pass a resolution authorising him to come until the government had reopened. During a closed-door meeting with House Democrats on Wednesday morning, Pelosi urged her caucus to stay unified and not to peel off and begin negotiating with the president on his terms, which could muddle the stark differences between Trump and them on a critical issue.